The Southwest Through Wide Brown Eyes: Early Fall at Nine Mile Canyon - Part One. Nine Mile Canyon is far from being nine miles; it's a total of 80 miles, so why the name? There are two theories, the first being due to the exploration of the Green River, in 1869, by John Wesley Powell. His cartographer (map maker) used a nine mile transect system for mapping out the area. The second story refers to the 9th Cavalry who built the road for better access to Fort Duchesne; not just to move troops, but supplies as well. That's pretty much considered "modern" history when it comes to Nine Mile Canyon; it's the ancestral Native Americans, including the Fremont culture and Ute, that makes this area a fantastical journey back in time. Roy and I have traveled the main 50 mile road twice now; each time we find more and more rock art and ruins. There are about 75 found sites and more are being found; we have seen about one third of what is known about currently. We plan to keep going back, when the weather permits; not to just ruin and rock art hunt, but the area is so serene and lovely. For the two times we've been there, I'm going to do a two-part write up for each; yes! I have that many photos to share with my readers. Due to the roads being repaved, the mile markers were also changed as much of the road was "straightened". There are many private ranches in Nine Mile Canyon, and several oil companies, so fixing the road was a must. I'm going to post a map Roy and I created for the travels we have done, and a legend of how to find the sites we now know about. I shared this information with the director of tourism of Carbon County, and she was very excited about it all. UPDATE: The map and legend below are no longer valid as of March 2015; click HERE for the new updated map and legend. Located in Carbon County, outside of Wellington (Route 6/191), Utah. An 80 mile road (50 miles west to east; 30 miles south to north); NO services available; private ranches (RESPECT private property/no trespassing signs); touring is FREE; take ALL trash with you; do NOT desecrate rock out sites. Set odometer to zero when turn made onto road to Nine Mile Canyon (from Route 6/191 onto Soldier Creek Road – currently a Chevron Station on the corner). 05.7 – Dugout Mine, south side of road. 21.1 – Entrance to Nine Mile Canyon. 24.0 - Nine Mile Ranch and Campground, south side of road. 26.7 – First Site (rock art site), north side of road. 27.7 – Cottonwood Glen Picnic Area, north side of road. 31.8 – Argyle Canyon, road travels northward; rock art half mile on eastern wall. 32.5 – Balanced Rock, north side of road; rock art around base of rock and along walls extending back from Balanced Rock; includes “The Juggler”. 33.6 - Harmon Canyon, road travels southward; upper walls on north side of main road have panels of rock art. 37.8 – Mud Swallow nests upper north wall; inscription from 1818 carved along bottom of wall. 38.1 – Stone house, north side of road; “Indian” wall with timber and rock art behind corral fencing. 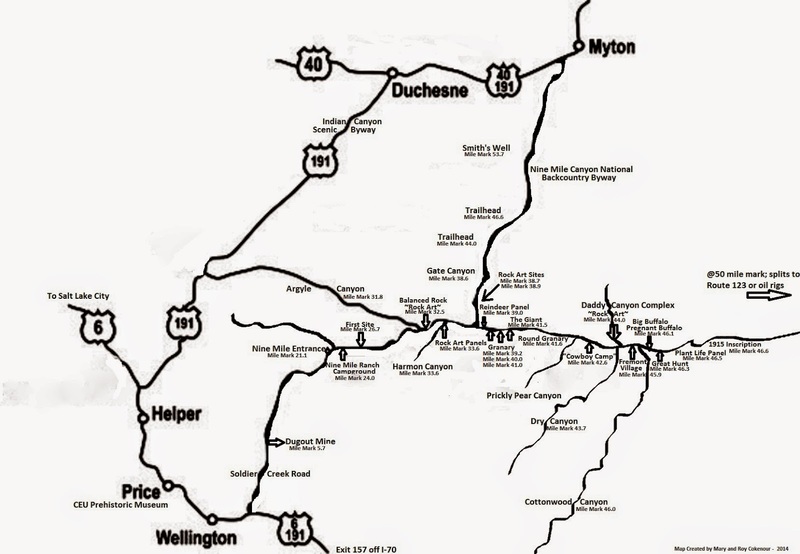 38.6 – 30 mile road northward to Gate Canyon, Trailheads, Summit Vista, Smith’s Well; ends on Route 40. 38.7 – Rock art on north side approximately six feet from ground level, behind plants. 38.9 – Short Trail leading into small canyon area; rock art panels high up on walls (right side) halfway up trail. 39.0 – Reindeer panel, north side of road. 39.2 – Granary with wood logs and thatched roofing located high up on northern wall. 40.0 – Granary high up on southern wall; park in parking area, look up and southwest. 41.0 – Granary almost at ground level, north side of road. 41.5 – “The Giant”, north side of road; immense giant human form carved into wall face. 41.6 – Round Granary high up on wall; look up and northeast. 42.6 – Ground level stone walls and fire ring; “cowboy camp”, north side of road. 43.7 – Dry Canyon, road travels southward. 44.0 – Daddy Canyon Complex, north side of road; numerous rock art sites; trail over dry wash leads to more rock art sites; restroom facilities available. 45.9 – Fremont Village, south side of road; extremely steep trail leads upward to reconstructed Pit House; buried Kiva passed along way (overlooks main road). 45.9 – Cottonwood Canyon, road travels southward. 46.1 – The Big Buffalo; rock art located behind sign; trail to Big Buffalo panel north side of road; Pregnant Buffalo located on wall behind fenced in area (Access Closed). 46.3 – The Great Hunt; rock art panel on south side of road. 46.5 – “Plant Life” Panel, south side of road. 46.6 – Inscription from 1915 carved onto south side wall. 46.8 – Paved roadway ends; unmaintained paved road that narrows and has blind curves begins; be aware of oil company vehicles. 50.2 – Oil company guardhouse; STOP; guard will inform when road is clear to continue to Route 123. The legend gives an idea on how to find the correct road, so I'll spare repeating those details and get right to the photos. When it comes to a scenic drive, this is one of the best; we brought a picnic with us both times. First Site is at mile mark 26.7; a short dirt trail, but make sure to examine the wall face from bottom to way over your heads. If you have the brochure given out by a visitors center, it states that Balance Rock is at 31.9 miles...not anymore! At mile mark 31.8 is a dirt road leading into Argyle Canyon; we drove it for about a mile thinking that Balance Rock was somewhere around (supposed to be close to the main road). No Balance Rock, but we did find some rock art, at SUV window level, about a half mile down. Back on the main road, mumbling to ourselves about stupid maps and rocks, when suddenly, at mile mark 32.5, well how could you even miss it...Balance Rock! We parked off the side of the road a little east and walked back; good thing too, or we wouldn't have noticed the rock art. It's not just on the bottom of Balance Rock itself, but further back along the walls on both sides. One of the figures is called "The Juggler" or "Balloon Man", but I have my own theory about it. I see this figure as a "creation figure", "The Great Father" creating the planets; like I said, my own theory. Besides the numerous rock art and ruins, pay attention to the scenery around you, and overhead; many rock formations are interesting in themselves. ...and that's the end of part one of the October adventure through Nine Mile Canyon. I so hope I've enticed you enough to want to take this adventure yourselves. Part Two will be chock full of more photos, so if I haven't enticed you yet; there's still hope!